How does the above statement resonate? Please read it again and allow its impact to sink in. One in four children in America pre-diabetic or diabetic and one of the leading contributors is the over-consumption of this highly addictive inflammatory white chemical drug we know as sugar. Evolution provided us with sensitive taste buds that will naturally cause us to gravitate towards foods that are sweet, fatty and salty, because we know such foods contain high energy and trace minerals for survival. The food industry, have cleverly used this knowledge to their advantage, engineering modern processed foods to be hyper-palatable and hyper-rewarding. The dopaminergic system in our brains is activated by foods that are high in sugar but unfortunately also very calorie dense and devoid of important nutrients. 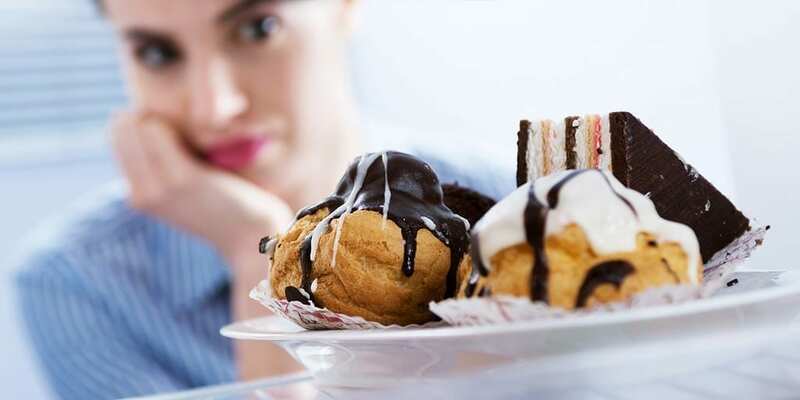 The truth is, these Frankenstein sugar laden, overly processed foods are so incredibly rewarding to our brains that they create addictive desires that influence our thoughts, cravings and behaviours, making us over consume without feeling satiated. Junk Foods are literally hijacking the biochemistry of our brains. 2. Always have an emergency snack ready: When blood sugar levels drop, the cravings will kick in and we live in a world of dazzling temptation. Carrying a healthy snack will help you to avoid giving in to a quick convenient sugar hit. Snack ideas can include nuts, seeds, berries, homemade protein bars, eggs, a piece of low glycaemic fruits, chopped veggies with nut butters or healthy sugar free dips. 5. Crank up the protein: Eating more protein will balance blood sugar, fuel the body, curb cravings and increase metabolic rate. Try organic eggs, poultry and meats, activated nuts, seeds, organic protein shakes and super foods. 6. Identify your triggers and reward system: Awareness is the first step towards change, once you identify your conditioned reward system and acknowledge your triggers, you can create and implement a healthier choice. Through repetition and consistency of the new healthier choices, you will be able to reinforce new habits without depending on will power or abstinence. 7. Practice Intermittent Fasting a few times per week: Chances are if you have been loading up on sugar, refined carbohydrates and alcohol for a long period of time then you might be suffering from Insulin Resistance. Research shows that Intermittent Fasting a few times per week can actually help the body to become more Insulin and Leptin sensitive. Try resting the digestive system by fasting for 16 hrs.and consuming all of your healthy meals within an 8-hour period. 8. Consume more fermented foods, prebiotics and probiotics: We are host to more bacteria than human cells in the body, which is why, it’s no surprise that these little bugs play a large role in our health. One of the biggest effects that researchers have now come to understand is that your microbial profile has the power to manipulate your food choices to create an environment in which they can thrive. Therefore, your gut bacteria may potentially be driving your relentless food cravings and poor dietary choices. The bad bugs thrive off unhealthy foods such as refined or processed carbohydrates, and sugar. What’s even more fascinating is they may even have the power to manipulate our mood via the production or inhibition of certain neurotransmitters in the gut. Try incorporating more prebiotics such as fibre, leeks, asparagus, garlic, onion, endives, artichokes, and resistant starches. Experiment by gradually titrating up the consumption of probiotic rich foods, such as; Kim chi, sauerkraut, kefir, kombucha, miso, yogurt, lassi, pickled vegetables and add a probiotic supplement if necessary. 9. Add Chia seeds and a dash of cinnamon to your water: This will keep you hydrated, prevent sugar cravings and stabilise your blood sugar levels throughout the day. 10. Get 8 hours good quality sleep: If you are constantly tired, you body will be seeking out a quick pick me up. When you don’t sleep, one of the first levels to fall out of line is leptin, a hunger hormone that tells your body when to stop eating. Sleep deprivation can also affect cortisol and the bodies natural circadian rhythms, which again lead’s to more fluctuations in blood sugar levels, and consequently, more sugar cravings.